CRAZY DISCOUNT! Was: $69.99 Now: $11.88! 1.ONE ESSENTIAL SYSTEM FOR ALL SKIN CONCERNS. Upgraded Skin cleansing kit with a detachable handle for both face and body cleansing. Body brush with an extended handle for cleansing hard-to-reach body areas to avoid skin problems. 2. 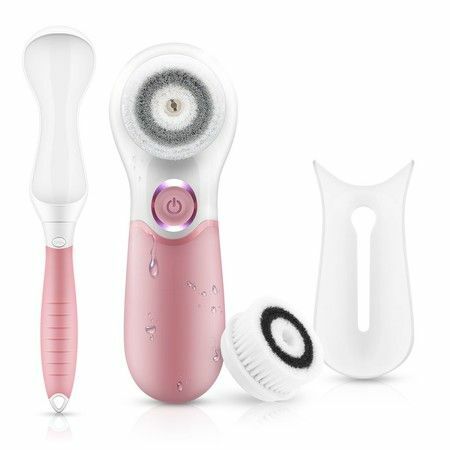 All-ROUND 360° ROTARY CLEANSING SYSTEM:3 different 360 degree rotating heads brush heads and 2 speeds setting delivers daily deep cleansing and gentle exfoliation. Suitable for all skin types: normal, dry, oily, sensitive. 3.IPX6 WATERPROOF, CORDLESS. IPX6 water resistant in the bath or shower (Do not immerse in water for a long time). Cordless; Requires 2 AA batteries (not included). 4.PREVENT ACNE BREAKOUTS, INFLAMMATION, REDUCE CONGESTION AND MINIMIZE PORES. Skin tone is instantly brighter and becomes more even with regular use. The spinning motion of the brush also stimulates collagen production for younger looking, brighter skin. 5.REMOVE MAKEUP INSTANTLY. Use with your favorite makeup cleanser and watch how fast and effectively your makeup washes off. Super effective at removing stubborn makeup, sunscreen, environmental pollution and built up grime.